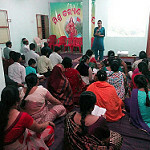 Vivekananda Kendra , Brahmapur (ODISHA) Branch had organized pariwar milan programme on 21st august 2016 at kendra premises. Kum. Varsha Didi Jivan vrati karyakarta was with us as chief guest. The programme was started by omkar chanting followed by Bhajan sandhya , Games , Patriotic Geets and Motivational clip of Azim Premji foundation who is presently working in the field of education was shown to the gathering to inspire them , for Man making and Nation building Mission . Kum. Varsha didi spoke on the topic of Grihastha Dharma is shrestha dharma and duties of grihasti in Nation building , along with speech a discussion was also held on this topic which was appreciated by the gathering. In the ending Rashtriya Raksha Bandhan (Bond of Protection of Rashtra) was celebrated in which all the participants tied a Rakhi on each others Wrist and taken a vow to protect our Rashtra, followed by kendra prarthna.